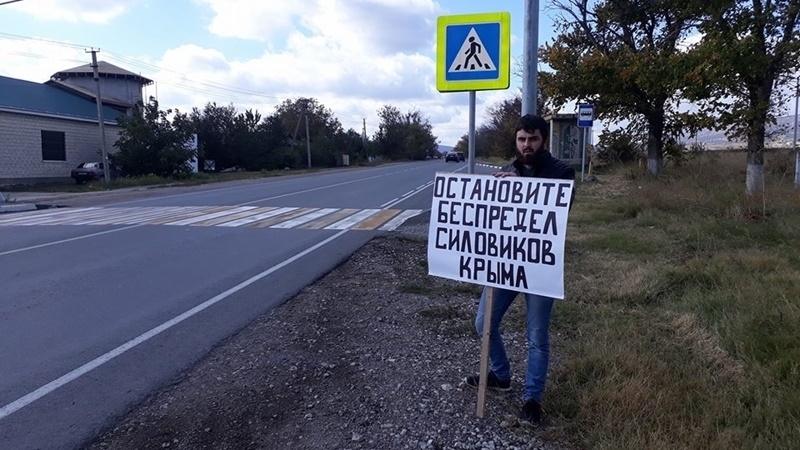 The so-called "Crimean police" continue to interrogate the participants of single pickets against reprisals by Russian security forces against the Crimean Tatars that took place on October 14, according to the video message of Tuvgan Dost on Facebook. Following the pickets, Crimean Tatars in the Belogorsky district received the summons from the Interior Ministry. One of the participants shared how the interrogation was conducted. He said that the police officer did not even introduce himself before starting the interrogation. “October 18, law enforcement officers came to the place of my registration at my parents’ home, and brought a summons for me to come on the 19 at 9 o'clock in the morning to the police department in order to testify in the case on October 14 (single pickets). The summons was drawn incorrectly - it was drawn not on my last name. My name, patronymic, and also in the place of residence, contained at least three mistakes as well. The officer who conducted the interrogation did not introduce himself. The first thing that stroke me, was that they did not read me my rights, or Article 51,” the participant noted. He went on saying that he was asked not only why he went to the picket, but also how long he stood there and if he knew other participants. “After I asked why I was summoned, as I did not violate any clause in the legislation of the Russian Federation, I was told that it was suspicious that so many people went to single pickets at the same time. I was told that this was suspicious and they were trying to find out the reasons," the activist said.